If your restaurant isn't clean, your customers won't come back. From dining rooms to restrooms, JayKay Janitorial & Cleaning Services LLC will make sure your establishment is ready for business every day you're open. We've been cleaning restaurants since 2008. We offer flexible scheduling that won't interfere with your hours of operation. For more information, call (216) 505-1610. At JayKay Janitorial & Cleaning Services LLC, we cater our cleaning services to the needs of your restaurant. From casual dining to fine dining, our experienced restaurant cleaning crew will make sure your restaurant is clean and sanitary. Whether you have one dining area or several, our staff will make sure every table is cleaned and disinfected with a cleaning agent that is safe for the environment and for people. We also wipe down all dining chairs. Our cleaning staff provides thorough floor care, light fixture cleaning, ceiling fan dusting, and more. Call (216) 505-1610 to tell us what services you require. We offer flexible cleaning schedules to best meet your business needs. First impressions go a long way toward making sure your customers keep coming back. High traffic common areas, such as lobbies or foyers, bars, and public restrooms need extra attention. Not only do they get dirty faster, but they also are more likely to host unseen bacteria. 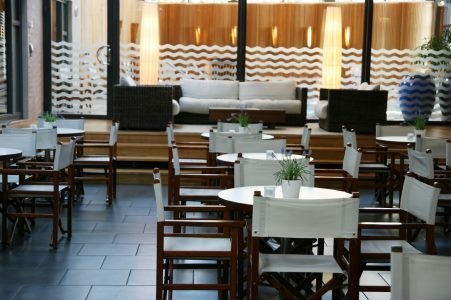 Make sure every inch of your restaurant is clean and sanitized with expert restaurant cleaning services, provided by JayKay Janitorial & Cleaning Services LLC. Call today for a free restaurant cleaning quote. Get your restaurant kitchen professionally cleaned by calling the commercial cleaners at JayKay Janitorial & Cleaning Services LLC: (216) 505-1610. We know what it takes to make sure your kitchen is properly cleaned and ready for food preparation.